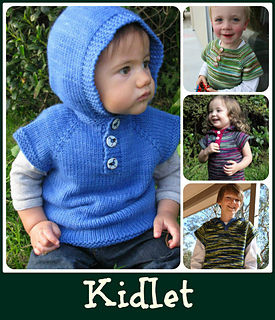 Designed to be a perfect seamless pattern for beginners – Kidlet is easy to knit and fabulous for all kids, from babies to 12+ year olds, boys and girls! 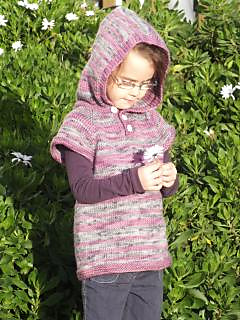 Knit from the top down (with the optional hood added later) it works well with gradient dyed yarns and single 200gm skeins – smaller sizes can be knit entirely from 200gms of yarn. 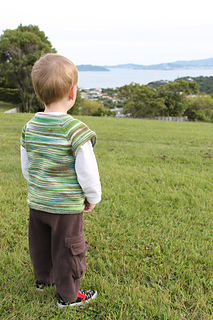 The sleeveless design makes it a versatile and staple garment for all children’s wardrobes. 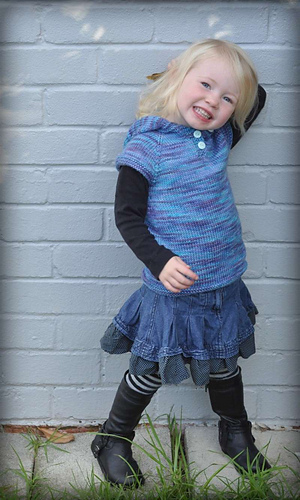 It can be worn with or without layers underneath and there are no sleeves to roll up for those younger children who like to get stuck in at the sandpit or water trough at kindergarten or daycare! 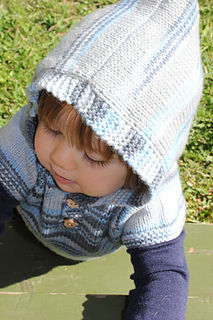 With the top button(s) done up, the hood is snug, perfect for cold mornings or playing at the park in winter. 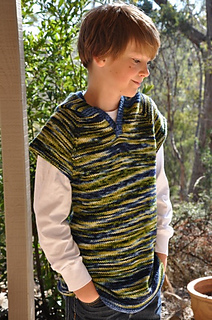 Undo the button(s) for a looser fitting hood and relaxed neckline. 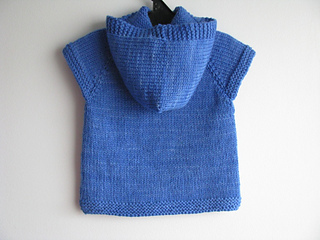 The kidlet vest/top uses simple knitting techniques, such as knit, purl, knit front and back, knitting buttonholes and casting on & off. 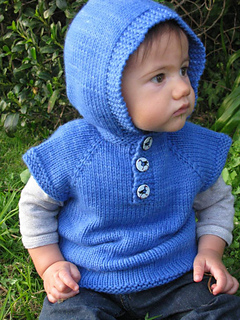 If knitting the optional hood, the knitter will be able to add a few new technqiues to their repotaire - picking up stitches and the seaming of the hood, by either kitchener or a three needle bind off. 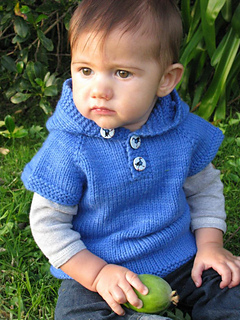 The final page of the pattern features a handy ‘cheat sheet’ outlining exactly what row needs to be knitted when increasing and knitting the hood, to provide additional support to those new to interpreting knitting patterns. 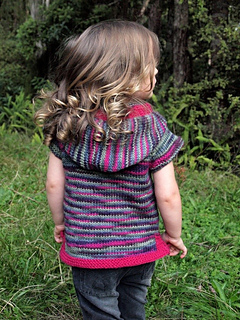 LICENSE FREE - In purchasing any patterns by Julia Stanfield you are also purchasing the rights to use this pattern for small scale commercial purposes, making items personally. 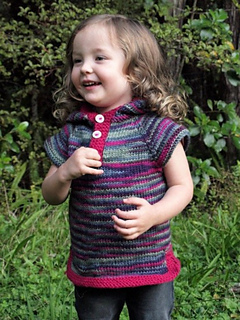 Please credit any items you knit for sale back to this pattern and Julia Stanfield as the designer. 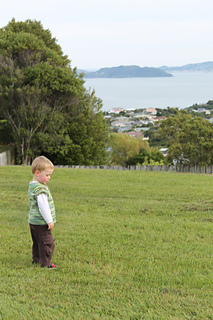 Yardage - approximate, in metres. 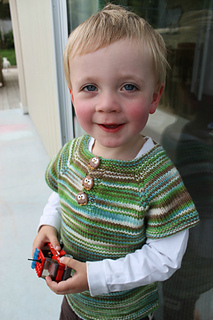 Add both together for the total of a Kidlet with hood.